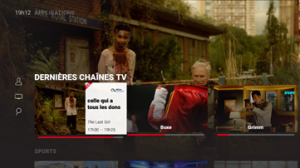 Altice France/SFR has launched a new Android TV OTT box to enable users to access its premium content on any TV set, whether they are existing SFR customers or not. 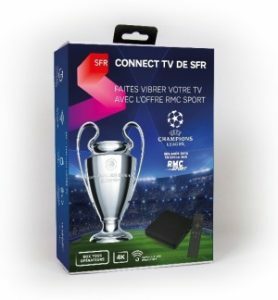 The Connect TV de SFR box is to be sold for €69, initially via SFR’s own retail outlets, with online sales to follow. The box is 4K-compatible and equipped with a voice-enabled remote control. Connect TV de SFR provides access to Altice’s RMC Sport offering, which includes Champions League, Europa League and English Premier League football. To promote the service the operator is providing a month’s free subscription to RMC Sport. Other content includes SFR Ciné-Series, the offering that encompasses Altice Studio and SFR Play VOD, with exclusive series such as the second season of Taken, Kingdom, Mr Robot and Mission-G.
Altice France said that SFR Divertissement, a package of thematic entertainment channels, would follow shortly. This will include channels such as SyFy, 13ème Rue, E! Entertainment, Discovery Channel, Discovery Family, Discovery Science, Discovery Investigation and My Cuisine. SFR is also providing access to the Google Play Store apps and integration with Google Assistant. According to the operator, Connect TV de SFR will enable users to connect any TV into a smart TV, however, it will also enable rto the operator to extend the reach of its services beyond its own fixed-line customer base without striking specific deals with the country’s other operators. Altice France/SFR CEO Alain Weill revealed in March that the company planned to launch an OTT TV offering as part of the plan for a return to growth that saw it rebrand its channels in order to make them more marketable to third-party operators. SFR indicated at the time that it planned to position its OTT TV service as a viable alterative to existing platforms in the market. The new box comes with the Android 7.1 operating system, 2GB RAM memory and 8GB Flash memory extensible with an external disk connected via USB or Micro SD Cards up to 32GB. The box is powered by an Amlogic S905X processor and includes 802.11ac/b/g/n WiFi and HDMI 2.0a connection.